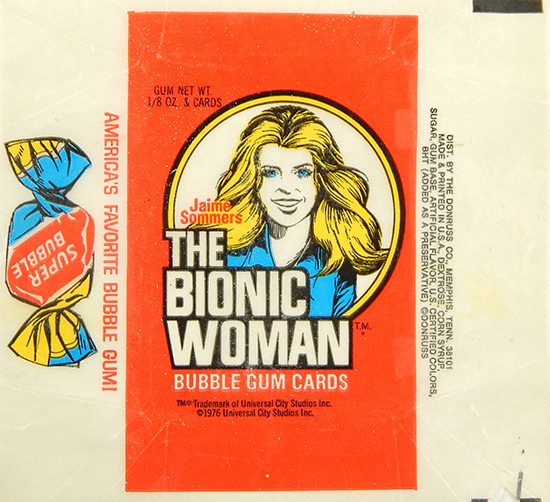 1976 Donruss Bionic Woman trading cards try to convey the beauty and strength brought to the forefront of the show. But like a lot of the card maker's entertainment sets at the time, the results are mixed. The 44-card checklist uses images from the show. The design is basic with the image surrounded by a white border. There's also a caption explaining the action (and many need it) that's sandwiched between the card number and the show's logo. Card backs are all puzzle pieces. The Bionic Woman came along when it required a lot of imagination to make special effects have some semblance of reality. When you speed it up for film, it can be a little bit easier. However, with the stills these trading cards bring, the results are laughable in many instances. Whether it's an obvious stunt double or a cheesy prop, most of the 1976 Donruss Bionic Woman trading cards don't bring the same level of excitement as watching the show on TV back in the day. It's not too tough to find 1976 Donruss Bionic Woman trading cards still today. Singles, sets, packs and boxes can all still be found without a lot of effort. Given the age, values remain reasonable as well. For a more modern spin on the adventures of Jaime Summers, there's 2013 Rittenhouse The Complete Bionic Collection. The set combines both this show and the one it spun out of, The Six Million Dollar Man. It also includes lots of autographs. 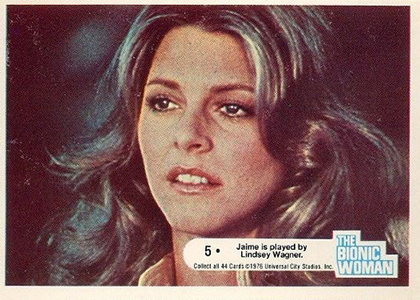 The BIONIC WOMAN MONTY GUM Trading Cards Lyndsey Wagner.The Bionic Women. 1 Jamie as a beauty queen. 2 Jamie rips open a bomb container. 3 With the Bionic leg Jamie can leap over buildings. 4 Jamie easily handles rough terrain. 5 Jamie is played by Lindsey Wagner. 6 Jamie has tremendous strength. 7 The Bionic woman hurls a bomb at enemy. 8 The Bionic arm bends bars to escape enemy. 9 The Bionic woman is beautiful and powerful. 10 Jamie rips loose a high voltage cable. 11 Oscar gives Jamie new information. 12 Jamie and Oscar discuss plans. 13 Jamie escapes through underground passage. 14 The Bionic arm can split logs. 15 Jamie ponders her next move. 16 Jamie leaps up to a high platform. 17 Jamie is a teacher when she isn't fighting crime. 18 Jamie leaps from a high cliff. 19 The Bionic arm slips through stonewall to escape enemy. 20 The Bionic arm protects Jamie and friend from falling rock. 21 Jamie leaps from house to chase outlaws. 22 With the Bionic arm Jamie easily pushes auto. 23 Jamie gives important news to Oscar. 24 Jamie leaps over two story house. 26 With Bionic strength Jamie can run like the wind. 27 Jamie at the controls of a locomotive. 28 Jamie drives a nail with her hand. 29 Jamie controls runaway elephant. 30 The Bionic ear hears sound from long distance. 31 Enemy approaches Jamie through jungle. 32 The Bionic arm crashes through door. 33 A real threat to the Bionic woman. 34 Jamie subdues king of the jungle. 35 Jamie hears enemy on the mountain above her. 36 Jamie leaps to the roof. 37 Jamie rips door off flaming auto. 38 The Bionic arm bends metal pipe with ease. 39 Jamie peers through fence at enemy hideout. 41 Oscar and Jamie pleased with success. 42 Jamie crashes through brick wall. 43 Jamie rips lock off enemy's hideout. 44 Jamie leaps from second story house.